Our latest adventure began with a Thursday evening flight to Pula, a seafront city on the tip of Croatia's Istrian Peninsula. Our flight landed almost an hour late, and as a direct result our first experience of local hospitality was a thirty-five euro "out of hours" charge that Enterprise were kind enough to tack on to our prepaid car rental booking. I'd have loved to tell them to go forth and multiply, but they were the only agency still open. At least ten passengers from my flight had car reservations, and one presumes that all were hit for the same thing, making for a very significant boost to the day's takings. We had a relaxed breakfast in our Medulin hotel then set out for the drive to Dinopark. Much of the routing was along the E751 motorway, but the journey still took the better part of an hour due to low speed limits in built up areas. 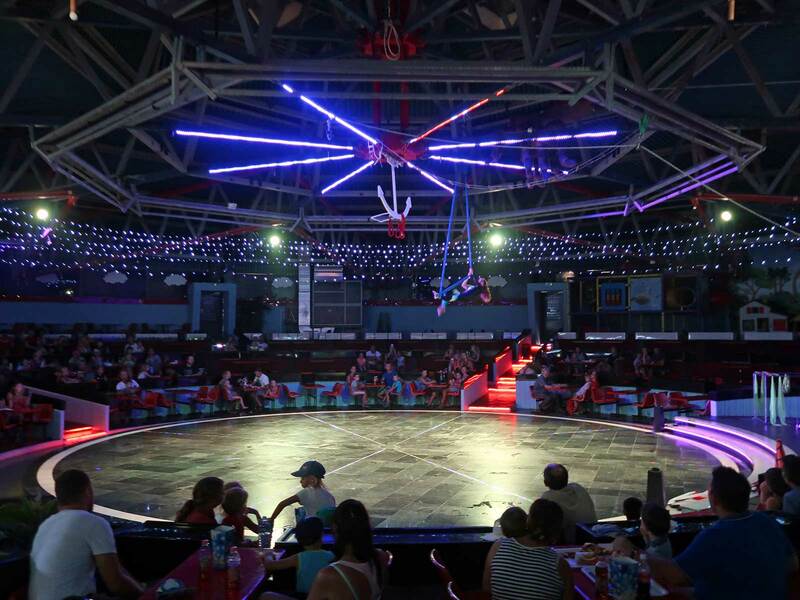 We arrived just in time for a performance of the circus show, and passed a few minutes watching the introductory acts, which featured a contortionist followed in short order by a juggler whose skill level was about what one would expect to find at a five year old's birthday party. The performance was rudimentary at best, and I quickly lost interest. Megan was somewhat more enthusiastic, so while she continued to observe I decided to amuse myself by taking a guest satisfaction survey on an iPad using the persona of an alien from another planet who was particularly impressed at the quality of the park's toilets relative to those found on Mars. Hopefully I gave someone a laugh. In due course we made our way over to the ride area, where we discovered a minor embuggerance: everything requiring an operator was closed for the duration of the show. There were a good number of animatronic dinosaur models to admire but with three quarters of an hour to play with we decided to see what else might be on offer. We wound up at Hightower, a scissors lift that took us to a height of around fifteen metres. The view from the apex was quite limited, consisting almost exclusively of trees, though we did enjoy the exceptionally silly soundtrack. There were a few other self-operated attractions in the mix, the most interesting of which was Stone Station, a tracked ride with suspended cars that was unfortunately off limits to us due to a fifty kilo weight limit. At the appointed time we made our way back to Dragon Coaster. There were plenty of children waiting to ride and given that we decided to leave the prime seats free, selecting a row in the middle of the train. Our vantage point gave us a clear view of the custom layout, which featured three helices in sequence; two ascending ones placed in the usual locations parallel to the station, followed by a third located off to one side that was connected back to the station by a S-turn. The experience was somewhat arthritic as the train struggled to lift a full load to the apex, but the descents were peppy enough, particularly at the base of the main drop where a sharp right turn marked the most forceful point in the layout. We decided to do a second lap out of courtesy before heading for the exit. We spent our afternoon visiting a number of tourist sites in the general vicinity of our hotel, including the Pula Arena and the Euphrasian Basilica in Pore&ccaron;. There was a small funfair located next to the latter that had a Yamasakutalab roller coaster, but it wasn't due to open until the evening hours, and we didn't feel like hanging around. We seriously considered making a return journey after dark, but it would have screwed up my plans for coaster number 2500, and besides we didn't feel like another two hours of driving. It was evening when we arrived at Family Park and made our way directly to Family Worm (#2497), a standard layout Big Apple from SBF Rides that was until recently the only permanently installed roller coaster in Croatia. RCDB has a photograph of a 15 Kuna (~€2) ticket from 2010, though admission today was via a bespoke 20 Kuna (~€2.70) token that could only be purchased with exact change from a vending machine at the ride entrance. The operators were not even remotely phased at adults riding together; in fact our train had more adults in it than children. We were given three laps, which was two more than we needed. 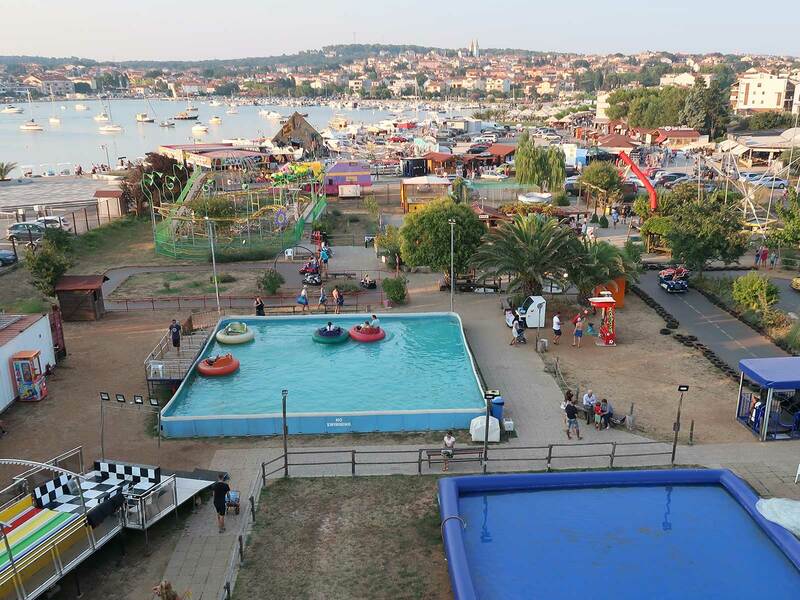 The only other adult-friendly attraction in the park is the Panoramski To&ccaron;ak, a fourteen car Ferris wheel from little-known Italian firm Park Rides. It wasn't at all obvious where to buy a ticket, but in due course we managed to source a 25 Kuna (~€3.35) plastic card from a food outlet located at the opposite end of the park. We were given an inordinate number of laps as the operator was far more interested in playing Angry Birds on his phone than he was in his customers; I found myself wishing for a slingshot which was clearly the most appropriate tool for getting his attention. We were quite grateful to the family who showed up to take our place; who knows when they eventually got to disembark?